I am using XCode 8 and testing with iOS 10.2 Beta. I have added the Photos, PhotosUI and MobileCoreServices frameworks to project. Using break statements, the app seems to crash at "presentViewController". This is a brand new app and I don't have anything else in the UI other than the grab button. Also, testing on iOS 9.3, this works fine. Am I missing something which might be changed in iOS 10? Check all the usage descriptions here. This app has crashed because it attempted to access privacy-sensitive data without a usage description. 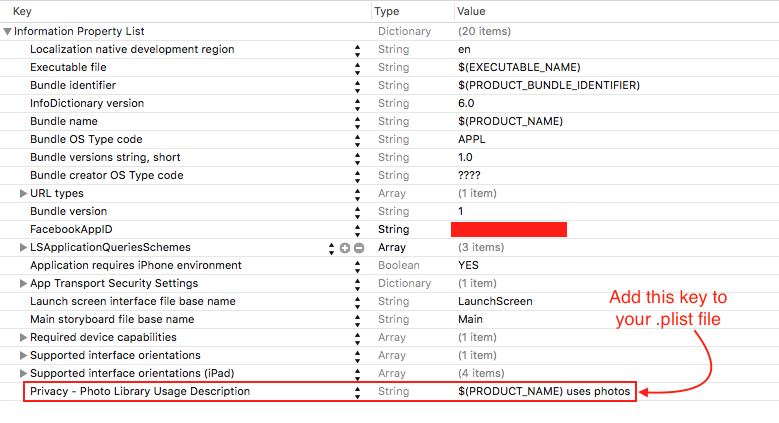 The app's Info.plist must contain an NSContactsUsageDescription key with a string value explaining to the user how the app uses this data. Open the file in your project named info.plist, right click it, opening as Source Code, paste this code below to it. Or you can open info.plist as Property List by default, click the add button, Xcode will give you the suggest completions while typing Privacy - with the help of keyboard ⬆️ and ⬇️. then clean your Project, run it. Go to here for more information: iOS10AdaptationTips . You need the add the new privacy settings to you info.plist. Don't forget to add the value describing why the app need to access the service. In iOS 10, Apple has changed how you can access any user private data types. You need to add the Privacy - Photo Library Usage Description key to your app’s Info.plist and their usage information. For more information please find the below GIF. Or if you want to add via info.plist then you need to add NSPhotoLibraryUsageDescription key. Just copy and paste below string in info.plist. Please find the below GIF for more information. Not the answer you're looking for? Browse other questions tagged ios objective-c uiimagepickercontroller presentviewcontroller ios10 or ask your own question. How to store the time period(duration) of a captured video in iPhone?